Celebrate what's beautiful about traditional style while breaking some of its rules: Take a page out of a designer's book and add your own sense of relaxed whimsy and exuberant personality to create spaces that are versatile, original, and truly livable. That's designer Celerie Kemble's philosophy in a nutshell. It's all about blending a classic sensibility with a dose of irreverence and a dollop of humor to achieve a home that's tasteful, eclectic, always evolving, and always welcoming. Celerie takes you by the hand, gives you a detailed look at many of her signature interiors, and enthusiastically reassures you that, with the right information and attitude, you can overcome challenges and artfully achieve the ultimate design goal-a perfect blend of beauty and comfort. 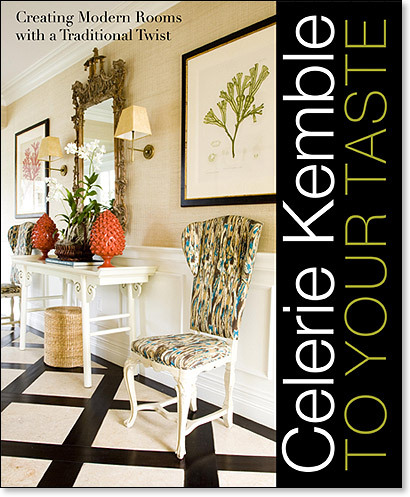 From finding inspiration in childhood memories, current trends, and favorite belongings to working around real-life design dilemmas (such as a lack of space or light, or awkward floor plans) to selecting just the right furnishings (including rugs, lamps, and accessories), Celerie Kemble: To Your Taste infectiously proves that when making a beautiful home, the process is the best part.